For cyclists, riding your bike from coast to coast is like the holy grail. Many dream about it, but few actually do it. I’ll admit, it was never really on my bucket list! But when Roger pitched it to me a few years ago I gave it some serious thought. We are planners and detail people, but the logistics for such a journey are overwhelming. 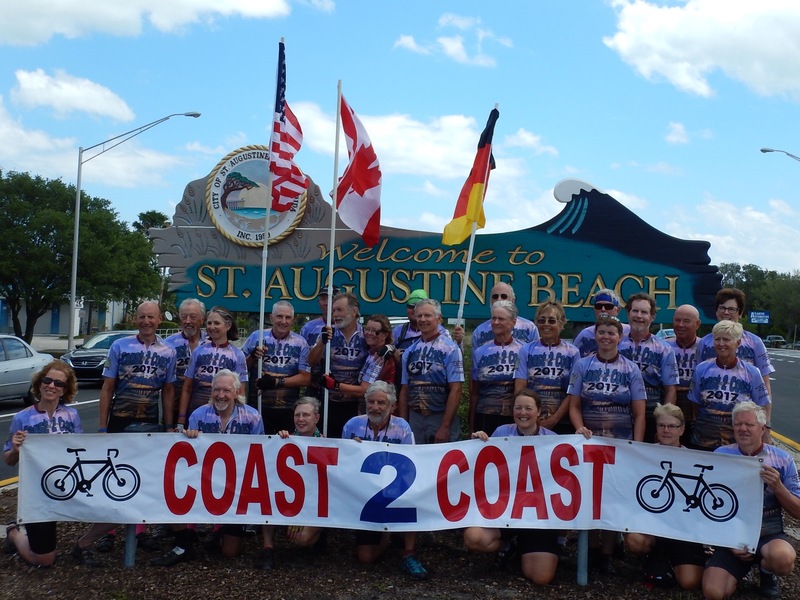 Because of previous BRAG (Bike Ride Across Georgia) participation, Roger received an email a few years ago about Bubba’s Pampered Pedalers Coast 2 Coast trip. He showed me the trip and the seed was planted. Yes, it grew and took root, and by the time the trip went in 2016 (one year prior to ours) we were pretty much in! We followed the trip daily and started to get excited about our own crossing. As has been documented, camping was the big sticking point for both of us. But this celebration of the start of our 60th years was about stepping way out of our comfort zones and doing something that required us to stretch our limits mentally as well as physically. We went into the trip with a positive attitude and kept it throughout the journey. Through bathroom facilities pathetic and impressive, we kept that attitude and really enjoyed ourselves. 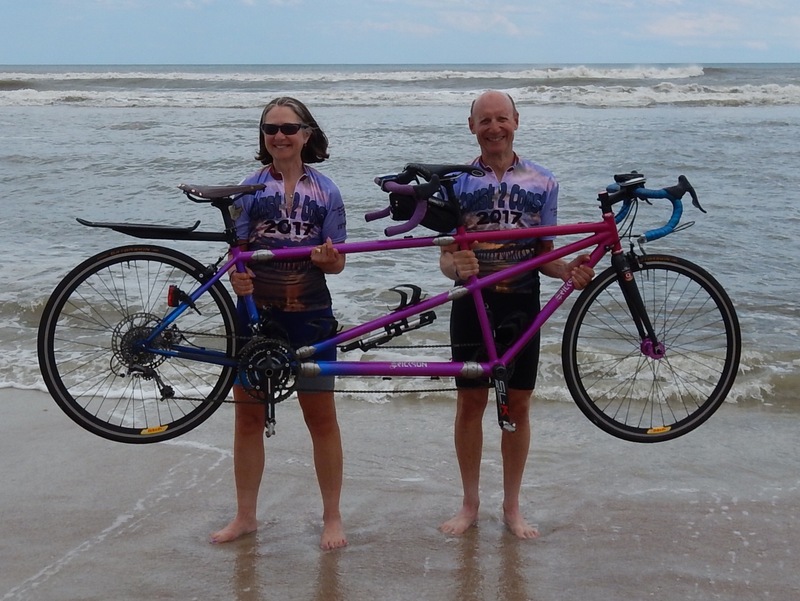 Many people questioned the sanity of undertaking such an epic adventure on a tandem. They tried to suggest that perhaps it would be too much “two-getherness”. They were wrong! I’ll admit there was that ONE day when I wasn’t very nice and I was in a crabby mood… which was ONE MORE day than my caring and considerate captain was less than congenial! What you don’t know is that right before the trip started my 92-year-old father took a spill which started a series of unfortunate events. He was adamant that I take this trip that I planned for so long, and to that end I didn’t find out that he was in the hospital until we were practically out the door. While I was pedaling across the USA, he was in and out of hospital ICU’s and rehab facilities. It was an emotional roller-coaster that had me awake at night when I was so physically tired I should have been sleeping like a baby. Dad is still in a rehab and improving daily. Soon he’ll be discharged to an assisted living facility nearby. Well, we did it! And we checked it off the list. We had our sleeping bags cleaned and all of the camping equipment is soon to be stored in the attic just in case! Although we ended up with the best possible weather that could ever be imagined or hoped for during a 52-day crossing of the USA, hotel camping is still my favorite type of “camping”! Thanks for reading along with us. We loved blogging the trip and we enjoyed all of your comments. I hope you’ll continue to follow us and keep up with our adventures as they happen. Thank you for taking the time to share your story; We looked forward to reading it every day. You both have been a real inspiration to all. Thanks for blogging so frequently and letting us vicariously share your adventure! Hope your Dad continues to improve. Enjoyed your blog every day as we cycled C2C altogether. Did not know then about your dad. Like him, my husband, my staunchest supporter, was adamant that I do the whole thing. We are fortunate to have loved ones who support us, no matter what. Really enjoyed your blogs across the country and all those little details as you two can tell. Blessings to your father. Congrats on completing the C2C!! You two are an inspiration. 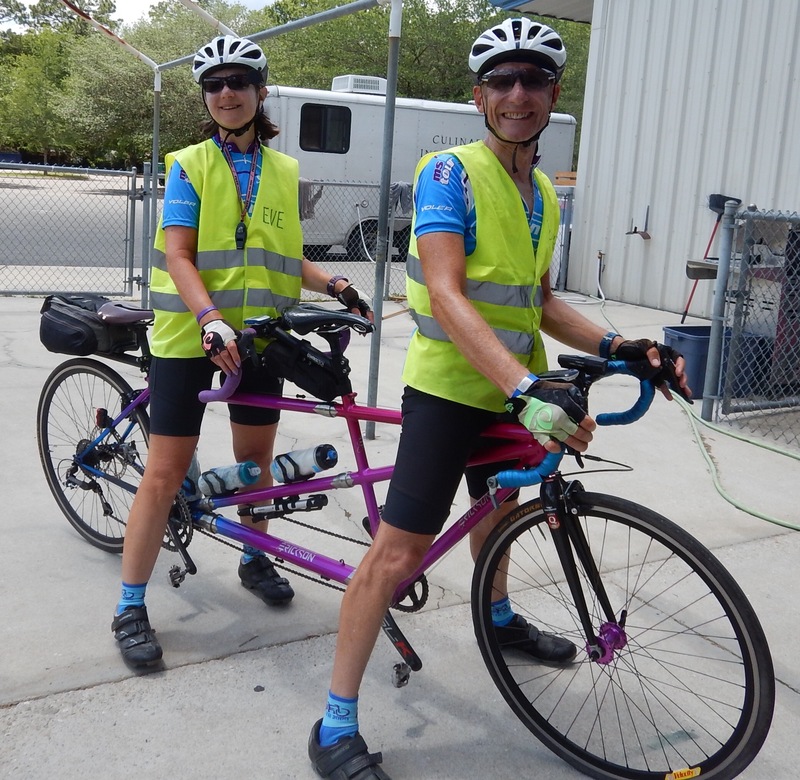 Everyone has had a ONE day on a tandem. Looking forward to seeing you in Valdosta tomorrow – still smiling! Yeah, I’ll go with those who are incredulous that you REALLY got crabby (at least as measured against the general population’s standard for crabbiness). 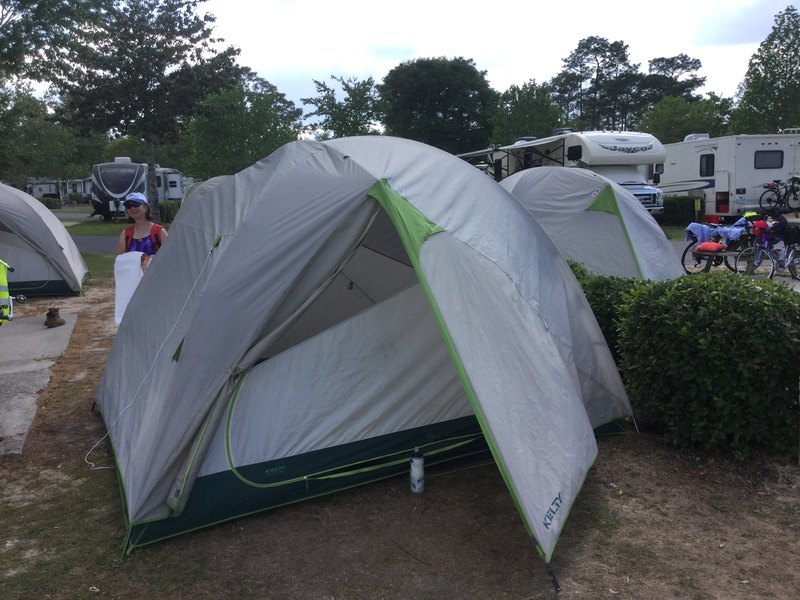 And… you could generate some retirement income renting out your camping gear! I’ll have to say, I kinda missed seeing your blog every afternoon after ride’s end. Thanks for including us. When do we do it again?